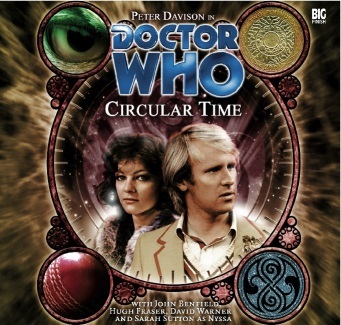 Paul Cornell and Mike Maddox collaborated on Circular Time a set of four stories for the Fifth Doctor and Nyssa. The stories are themed around the four seasons with an ensemble cast picking up the other parts. I came to this with a sense that it was a popular release in the Big Finish forums. Were my expectations of a decent set of stories realised? Winter: is ambitious and one for the fans. The only real topic for the season is the surprise twist of the setting revealed at the end. This story is also important for its link to the later return of Nyssa in Cobwebs. Despite the plot and its well-worked use of continuity with the TV series I wasn’t entirely taken with this story. For me the pieces were there but the construction didn’t quite work. I wonder if I would have preferred a shorter story. Maybe my problem is the lack of unification across the four apart from the seasons being the settings. Overall though there are no bad stories here and it is well worth a listen. Greatly enjoyed your review on ‘Circular Time’! This is my favourite Fifth Doctor/Nyssa audio CD since it was the first and my introduction to Big Finish. ‘Autumn’ is my favourite out of the collection. Thanks for your reviews on each of the four episodes of this release. I think Autumn was so strong, Winter had a tough act to follow. I also felt a bit let down by the overall lack of unity, though were I to re-listen that might not bother me so much now. Tastes change!